Chocolate and Peanut Butter Cake - Happy Birthday to Me! Today is my 59th birthday and I can't begin to tell you how grateful I am for that number! I will take every birthday that comes my way with open arms. After getting diagnosed with cancer you certainly have a different outlook on every single day you wake up. You appreciate the good days and you certainly appreciate your physical appearance after going through chemo. Every eyelash that is beginning to grow back makes me so happy and that is happening right now. I look forward to washing my face in the mornings to take a closer look at my eyes and eyebrows. Looks like the eyebrows are gonna be a bit slower. Thank goodness for brow liner. I did manage to keep a thin layer of hair on my head as I was never bold enough to just shave it all off. It looks and feels like cotton...it is just so fine and so white. I have colored my hair since I was 16 so I had no clue how gray or white I would be. As soon as I have enough to color, you can bet that will be one of the first things I do. LOL Oops...didn't mean for this post to be about the cancer but I guess having another birthday, it just took me there. Onto the delicious cake recipe. This is a new recipe for me that I found on the internet and it came from Taste of Home. It is quite delicious! I have forever loved the combo of chocolate and peanut butter and the beauty of this recipe is that you most probably have all the ingredients in your pantry or kitchen. I chose to make this into a sheet cake and it came out really nice. I hope you like it! Enjoy! 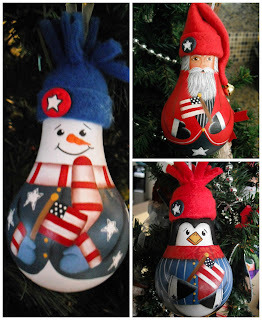 Told ya I am trying to get ahead for a change and paint up some 4th of July items. This is my latest design. Hope you like him. 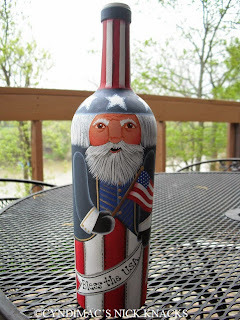 This wine bottle would make a perfect patriotic decoration for your home. He is very detailed. I have him listed in my Etsy shop for $40.00. A lot of work goes into this bottle. 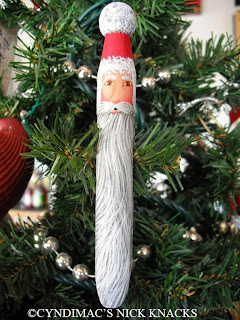 You can find him at cyndimacsnickknacks.etsy.com. Sure wish I could get the link above to work but have tried numerous times and it just doesn't work. Thanks for looking! This salad has everything in it but the kitchen sink. I just love this salad and wonder why I always wait to make it in the spring/summer. It would be great year round. You can use it as either a side item or as a meal in itself. It looks great in a big clear bowl because it is layered. My mouth is watering just thinking about it. On my "to make" list very soon. Enjoy! Prepare cornbread mix per directions. Combine salad dressing mix, sour cream and mayonnaise, set aside. Crumble half of cornbread into bowl. Top with half each of beans, sour cream mixture, green peppers, corn, tomatoes, bacon, cheese and green onions. Repeat layers. Cover and chill 2 hours. Serve in individual lettuce lined bowls and top with tomato wedges if desired. 8 servings. 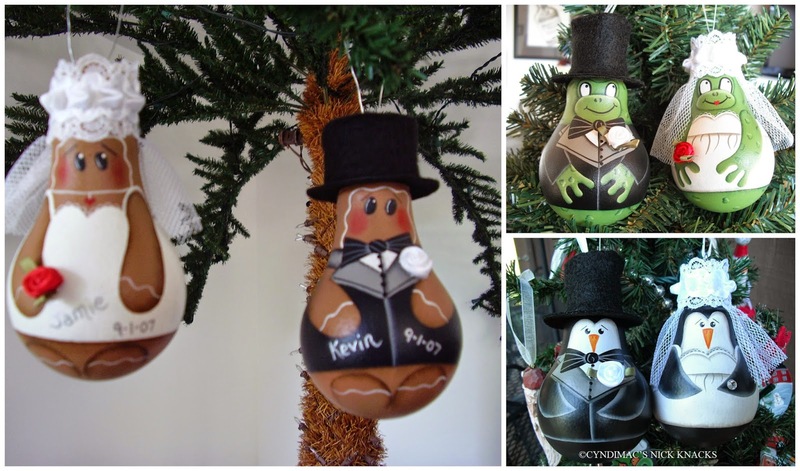 I have expanded my line of bride and groom lightbulb ornaments. If you are looking for a unique gift for your favorite bride and groom, look no further. These are also very cute used as wedding toppers. I am open for any ideas and can custom make these for you. I personalize them with the names of the bride and groom and the date of the special day. 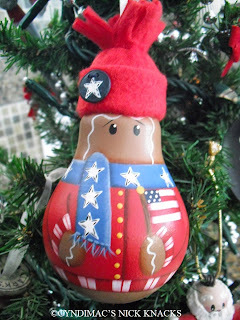 These can be found in my Etsy shop at cyndimacsnickknacks.etsy.com. They are $35 per set with free shipping. Thank you! Have leftover boiled eggs from Easter? Kroger still has their eggs on sale so I decided this was the perfect time to make one of my favorite pasta salads. I thought I'd share it with you. Also, on Rachael Ray's show today she told how to make the perfect boiled eggs and I tried it and it worked perfectly! Never too old to learn a few new cooking tricks. They peeled beautifully...now that makes me a happy camper. Here is the trick. Put eggs in a cold pan and cover with cold water. Bring water to a rapid boil, turn off the stove and put a lid on the pan. Time it for 10 minutes, then drain eggs and add cold water to them. Crack the eggs a little bit and let them sit in the cold water for a little bit. This loosens the shells. Cook pasta al dente; drain and rinse in cold water. Drain again. Mix together the Miracle Whip (or mayo), mustard, vinegar, salt and pepper in a large bowl. Gently fold the pasta, eggs, and pickle relish into the Miracle Whip mixture. Sprinkle with paprika. Cover and refrigerate until served. I have been busy stocking up on patriotic ornaments since the 4th of July will be here before we know it. Gotta think ahead! Here are the ones that I currently paint. These would be so cute on a 4th of July tree or just to keep up all year round. 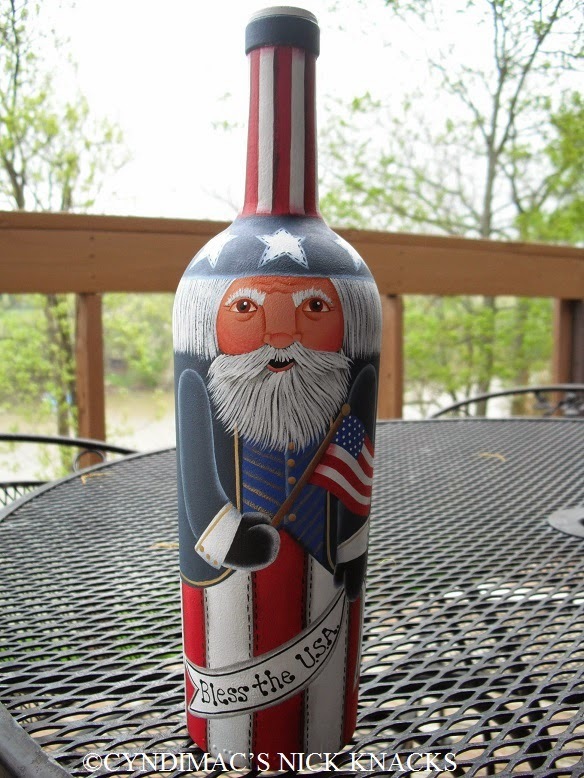 I am thinking about painting up a few patriotic wine bottles next. Stay tuned! These can be purchased from my Etsy shop. 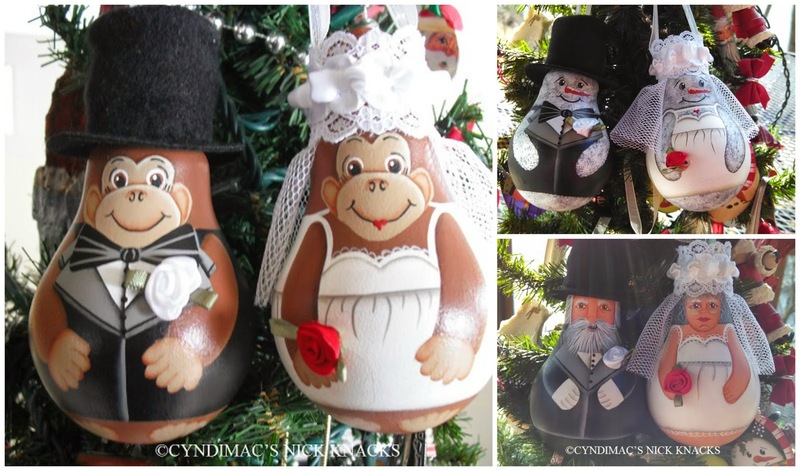 cyndimacsnickknacks.etsy.com. Thank you for looking!